If you're dying to take advantage of solid state drive's fast boot times but can't afford actual solid state drives here's a ghetto fabulous one from GeekStuff4U. 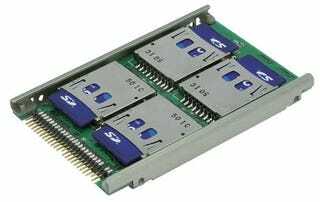 This DIY drive gives you four slots to put 2GB SD cards into, which in turn combines into one large 8GB drive which your laptop can use as the OS drive. Since this is using SD cards—and four of them at that—there's no guarantee the performance will be anything above "meh".